Toast to your union with an exquisitely crafted symbol that you can "have" and "hold." 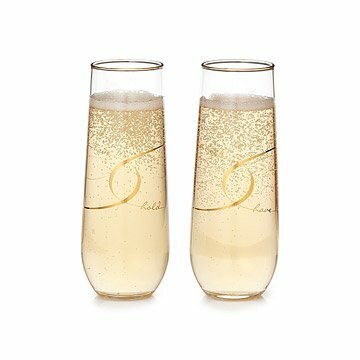 This pair of stemless flutes commemorates your union with a powerful, exquisitely-crafted symbol that you and your partner can hold in your hands. Featuring real gold script, an interlocking infinity ring design orbits the glasses and gold rings adorn the rims forming heartfelt, handheld renditions of the sacred vows "to have and to hold"--have and hold alternate position to make the glasses unique counterparts and elegant alternatives for design-loving couples' celebrations. Glasses made in the USA. Decorated in Edina, Minnesota. Check out the wine glasses. I bought these as a wedding gift for two dear friends. When the package arrived, I had to see what the flutes looked like before they went off to their intended owners. They are absolutely stunning. Worth every penny. I was very happy with the look and quality of these glasses. With a bottle of champagne, it made a very nice gift! Sent these to my granddaughter for her up coming wedding. She was thrilled by the unique style and design. I have purchased these twice for a wedding gift and a one year anniversary. they were a hit. The packaging is beautiful and keeps the glasses safe during shipping. Can't say how well they wear or anything else about their lifetime usage but they make a wonderful, thoughtful gift and a very nice presentation. Beautiful glasses and like the weight, perfect. We'll be using them at our wedding. They're absolutely beautiful. They're a bit smaller than expected, but beautiful nonetheless. The elegant flutes will be used at my wedding next month! I am very happy. Thank you for making my gift exchange a pleasant experience. I was hesitant initially but you were wonderful. I am so grateful. Thank you once again.